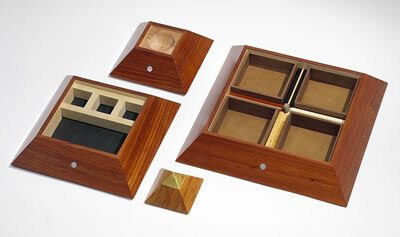 This box is one of 11 Pyramid Keepsake Boxes to be made as a special closed edition series. This particular box is the original prototype (#1 of 11) which has been gifted to Grandfather Martin Gashweseoma, who is the eldest elder of the traditional Hopi tribe located on Third Mesa in northern Arizona. Grandfather Martin is also Guardian of the Sacred Stone Tablets of the Hopi Fire Clan. This box has been named Sneferu, which is a name inspired by the first Pharoah reigning in the Fourth Dynasty of ancient Egypt. There are 3 pyramids attributed to Sneferu's reign.Sneferu is Shining in the South and located in Dashur, this pyramid was constructed between 2613-2589 BC. 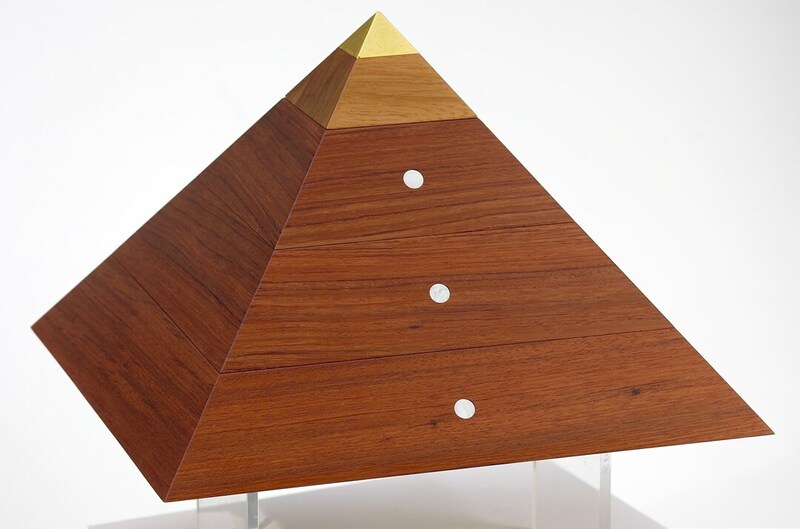 The precise dimensions of this Pyramid Keepsake Box are founded in the same exacting proportions used to construct the Great Pyramids at Giza, in Egypt. Central to this geometry is a mathematical ratio known as the Divine Proportion, or Phi, which is numerically represented by the number 1.618034. The shortest distance from the exact center of the base of this box to the outside face is 6. The overall height is 7.63.